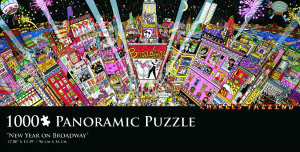 On the Twelfth Day of Fazzino, we offer to you…20% off the Charles Fazzino “New Year on Broadway” Panorama Puzzle. Celebrate the heart of New York with this 1,000 piece puzzle. MUST ORDER BY December 18th for Christmas delivery. Plus, we’re giving one of these puzzles away for FREE. Just post a comment on this blog or on the Fazzino Facebook Fan Page answering our holiday question of the day by midnight tonight and you’ll have the chance to be our randomly selected winner.